Family enjoys Butterfly Garden in Changi, Singapore's international airport. 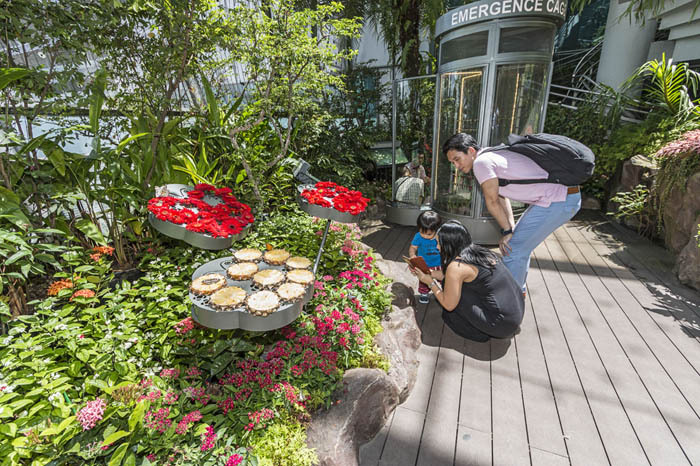 Caption: Family enjoys Butterfly Garden in Changi, Singapore's international airport. Comments: Family enjoys Butterfly Garden in Changi, Singapore's international airport. This garden, in Terminal 3, is one of four gardens in the airport. Changi has been voted best airport in the world for dozens of categories (approximately 480 awards over two decades at last count) including shops, entertainment and best airport to sleep in. There are approximately 350 retail and services outlets plus 120 restaurants, cafes and bars.